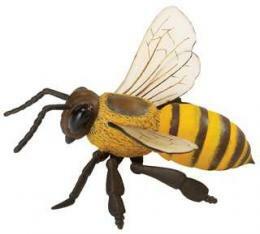 Honey Bee Toy Life Cycle Miniature Replica is insect lover imagination fun at Anwo.com Animal World®. Made of safe, detailed, durable plastic this set features 4 stages of a Honey Bee's development. The four pieces are an egg in a honey comb section measuring 2"L x 1"W x .5"H, a larva measuring 1.5"L x .5W x .5"H, a pupa measuring 2"L x .5"W x .5"H, and an adult Honey Bee measuring 2.5"L x 2.5"W x .5"H. Shop our Bee Gifts Bumblebee at Anwo.com Animal World® page for additional Bee gift items. If you have school project on the life cycle of bees the bee life cycle toy replica is a must have to complete the task successfully.